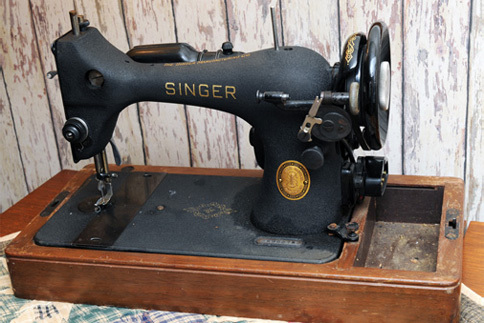 At the time of this writing, we have three Singer 128s. It was Elizabeth's idea that we add this all-black one to our collection. Where other 128s have chrome finished parts, this machine has black-plated parts. It is a blueing process that covers both slide plates, face plate, and bobbin winding mechanisms. Apparently, some black accessories were also supplied with these machines. The crinkle finish does appear to wear well and resists rust. The finish may be referred to as wrinkled, matte, textured, and godzilla. I personally don't care for crinkle paint machines because I've never been successful in cleaning them. I must admit, however, that I am becoming attracted to this machine as it is the only all black machine we have. But I have no plans to use it to sew anything for several reasons which will be explained below. We have seen other versions of the light. 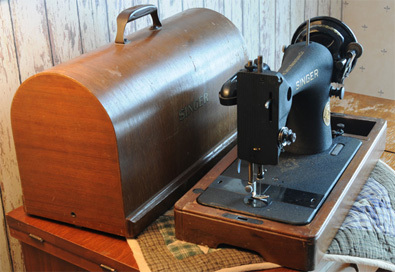 The 128 uses an oscillating bullet-shape bobbin case. There should be a felt-oiler to lubricate the bobbin face as it slides around the arc, but we are unable to find the small opening in the casting where the felt contacts the bobbin case. In the interim, we applied a small amount of oil to the surface with our finger. 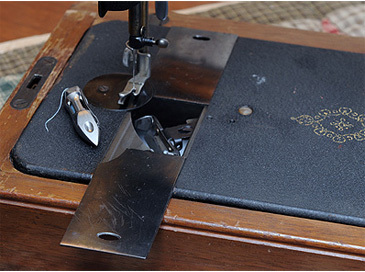 The bobbin is a spool that is wound by a clever winding mechanism seen below. The bobbin doesn't appear to hold as much thread as newer bobbins, and since it has a small diameter axle, it puts a tighter twist into the lower thread--especially if allowed to sit for any length of time. The back slide plate on this unit is stuck and we are trying to determine the best method of moving it. We will probably put something soft--like a piece of wood--on the plate and tap it with a hammer as we don't want to damage the plate's finish. 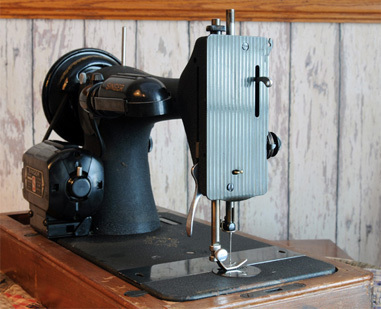 The 128 is a 3/4-size machine and slightly larger than a 221 Featherweight. It uses a standard 15 X 1 needle and low-shank feet. 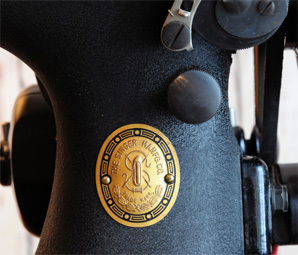 The round knob seen to the upper right of the decal is the only control on the machine and adjusting this control regulates stitch length. There is no indication as to the stitch length--you simply adjust the control until your desired stitch length is obtained. There is no forward/reverse control as the machine will sew only forward--another reason why I'll never use it for any serious work. 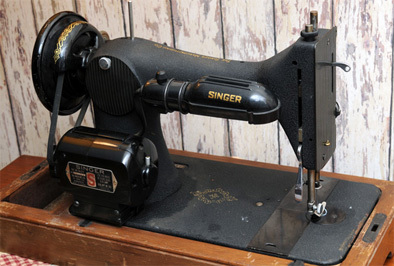 This Singer 128 has a black striated faceplate. Its serial number is AK982793. According to Singer data, 10,000 units were allocated on July 23, 1952. It was manufactured in Elizabeth, New Jersey. While our machine has a non-black presser foot, we have a black one in our parts stash and wonder if it would be appropriate to install it on this machine?